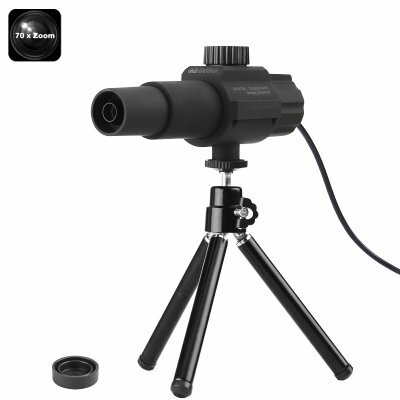 Successfully Added Portable Digital Telescope - Fixed 70x Zoom, 2MP Camera, Motion Detection, Tripod, For Daytime Use to your Shopping Cart. With its fixed 70x digital zoom, this smart digital telescope that has been designed for daytime use lets you observe objects from miles away. Whether you want to keep an eye on your property, monitor a professional sports game, or observe nature in all its glory – with this digital telescope nothing will be outside of your visual reach. A 2MP camera and 2-degree viewing angle provide you with all that is needed to record video from afar in sharp HD quality. Featuring a small and light weight design this USB telescope is extremely portable and can be easily carried around no matter where your journey takes you. The perfect accessory to observe and capture Mother Nature’s animals and landscapes in their fullest beauty, this portable digital telescope allows you to take the most out of your upcoming holidays and nature trips. Additionally, this 70x digital telescope is the perfect tool for home and industrial security or to monitor traffic from further distances without the need for additional electricity, storage hosts, or any remotely operated security cameras. With its motion detection features, you can be assured that not a single movement stays unnoticed with this powerful security camera in place. In cooperation with its digital software, that can support up to 4 cameras at once, this miniature telescope can record video and save pictures straight to your tablet or laptop. Added to that, this software highly compresses the recorded files, ensuring that only a limited amount of hard disk space will be used. Easily connect this miniature telescope to your tablet or PC by means of its USB 2.0 wire. Being compatible with Windows XP 2000, Vista, Win7, Win8, and Win10 this little electronic gadget is easy to install and runs on all the major Windows Operating systems. Coming with a high-quality tripod you can be assured that this smart digital telescope records clear and stable images even when recording from miles away. This small and portable USB telescope is the perfect tool to keep an eye on your property or to observe nature or social events such as a sports match or music concert from up far – allowing you to enjoy a live cinematic front row experience in stunning HD resolution. This smart digital telescope comes with a 12 months warranty, brought to you by the leader in electronic devices as well as wholesale electronic gadgets..